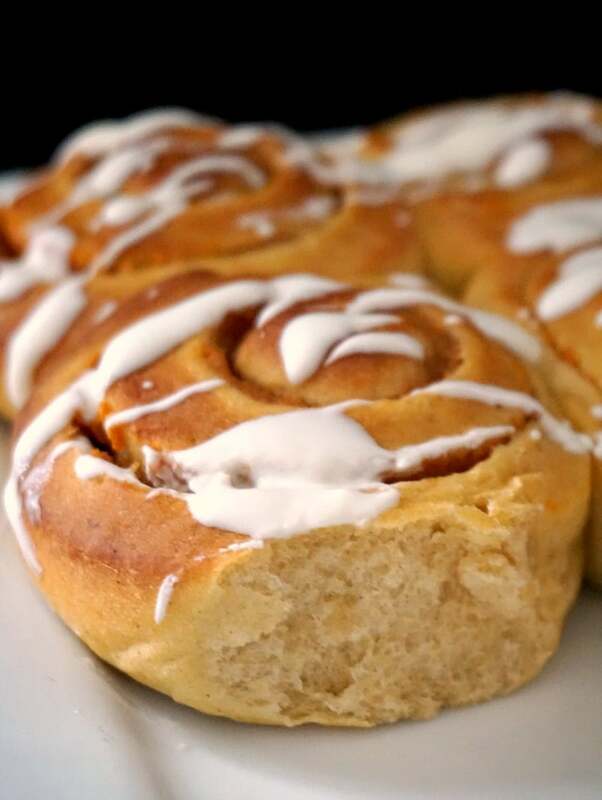 Fluffy Pumpkin Pie Cinnamon Rolls, a sweet treat for all the pumpkin lovers out there. Fall wouldn’t be the same without pumpkins, and we must make the most of them before the season is over. A great choice for the Thanksgiving menu, or throughout the pumpkin season. I remember as a child I just loved carving pumpkins with my cousin. Since my family lived in a farm, there were loads of pumpkins around, and we couldn’t be happier. The bigger, the better. And some of them were gigantic. Not quite sure we were aware of what Halloween was all about, we probably didn’t care much about it, but the tradition of carving pumpkins was something we really enjoyed. My grandma used to bake a big pumpkin in an old-fashion brick oven and we all were having some. There was hardly anything left for baking or cooking, but I think we loved eating it on its own better anyway. I haven’t been home in Fall time for years now, and l really miss the harvest time. I think I need to plan the holidays around Autumn too, but then I guess Christmas, Easter or summer time are the favourite times to go and be with the family since we don’t celebrate Thanksgiving. I might not have had the fanciest clothes, the best toys, but I had something I will treasure forever: a loving family who made every season special. I can’t wait for my little girls to be big enough to have fun on the farm too with the grandparents. I really want them to be able to understand our traditions, even if they were born in a different country and they are pretty much more English than Romanian. My elder daughter is only speaking English so far, although she does understand Romanian too. We really need to work on it! I’m hoping that through cooking I can get them to appreciate the Romanian cuisine and traditions. 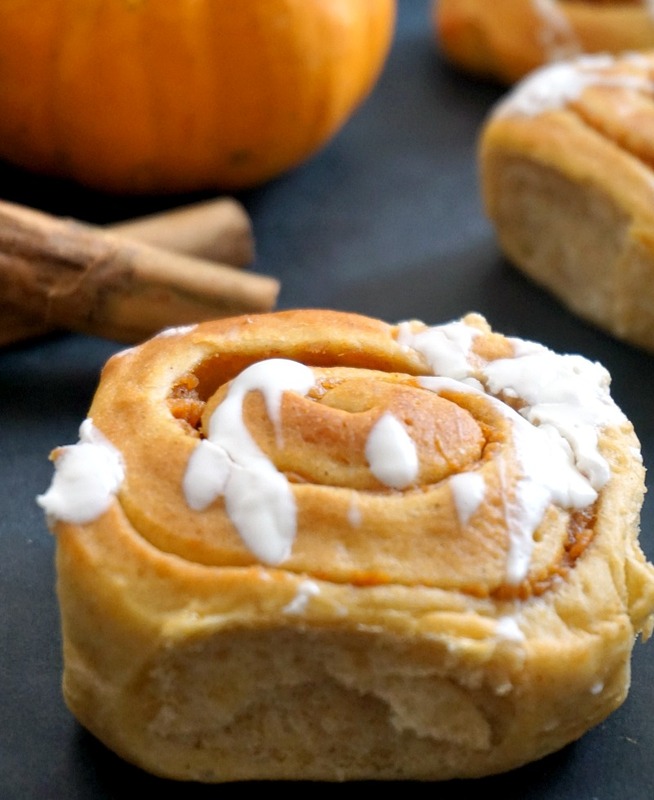 These pumpkin cinnamon rolls are the perfect example why l love baking so much. You don’t just see Fall everywhere, you get to taste it too. 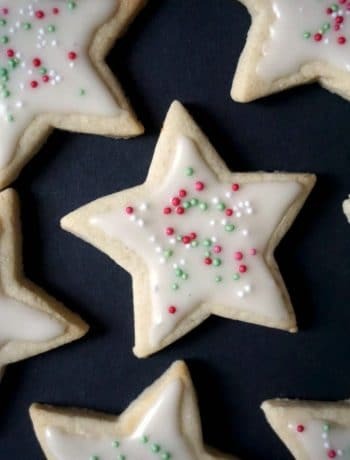 It might look like it’s complicating, but baking them is actually easier than you think. Waiting around for the yeast to work its magic on the dough does take a bit of time, although once you kneaded the dough and let it prove, you can get on with something else. The secret to making fluffy rolls is using a good quality yeast. And to check if that is the case, you have to add it to lukewarm water together with a bit of sugar and flour and let it sit for about 10 minutes. It should form a bubbly foam, meaning that the yeast is active and the dough will double its size the way it should. If after the 10 minutes the yeast does not look like in the right-hand side of the photo below, you have to try again from scratch. I did once bake even if the yeast did not get foamy, l thought that shouldn’t make such a big difference, but, guess what, it did. The dough didn’t rise much, and the rolls ended up a bit dry, and nowhere near as fluffy. Lesson learnt! No skipping important steps in baking, shortcuts might work somewhere else, but not here. Like with most bakery products, the rolls need double proofing, once when the dough needs to double in volume, and second time after the rolls have been formed. You can add them to the baking tray, leaving a bit of space between each of them, they will fill that space, just let them sit again for about 30 minutes to one hour. 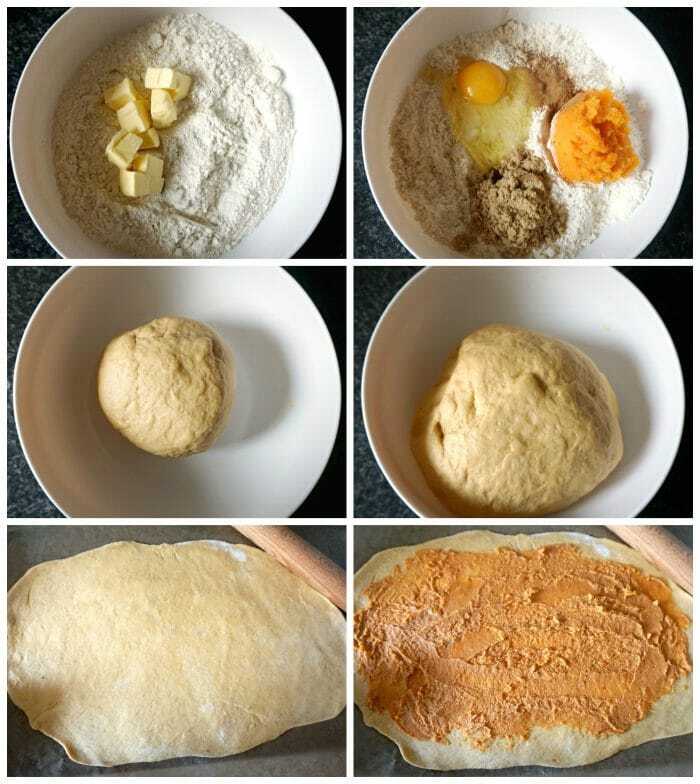 It all depends how warm is in the kitchen, l usually cover the dough bowl with clingfilm and then wrap it around in a kitchen towel, to make sure it keeps as warm as it can. They will rise further in the oven, but it’s best to get them to rise as much as possible before as well. 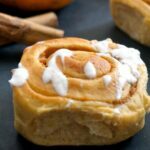 Now, you won’t believe how little sugar you need for these pumpkin pie cinnamon rolls, since the pumpkin is naturally sweet, I personally don’t add more than two tablespoons to the dough, and one tablespoon to the filling. Fell free to add more if you like sweeter desserts, it’s all up to personal preference. For the glaze, I opted for a not-so-fancy yogurt glazing, rather than the richer, sweeter, naughtier vanilla buttercream. 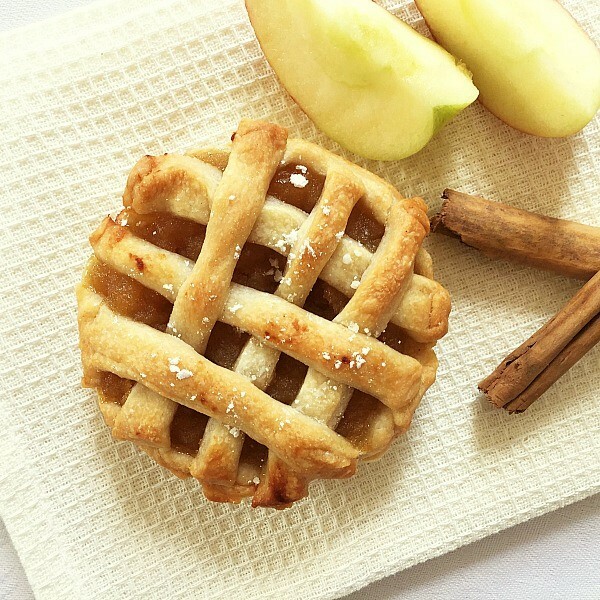 All in all, this is a dessert I just love in Autumn time. Super easy to make, delicious, it goes well with the whole family, and, most importantly, it’s got pumpkin!!! And, the good thing is that you can make these rolls in any other season too, the pumpkin can easily be replaced with sweet potatoes or even butternut squash, the difference in taste should not be great. Wait, have I mentioned that I love pumpkins? Hands up if you love them too!! Now, let’s have some rolls, they are fantastic either warm or cold. If you happen to have so more pumpkin puree, why not try these fantastic pumpkin squares? They are so very yummy too. 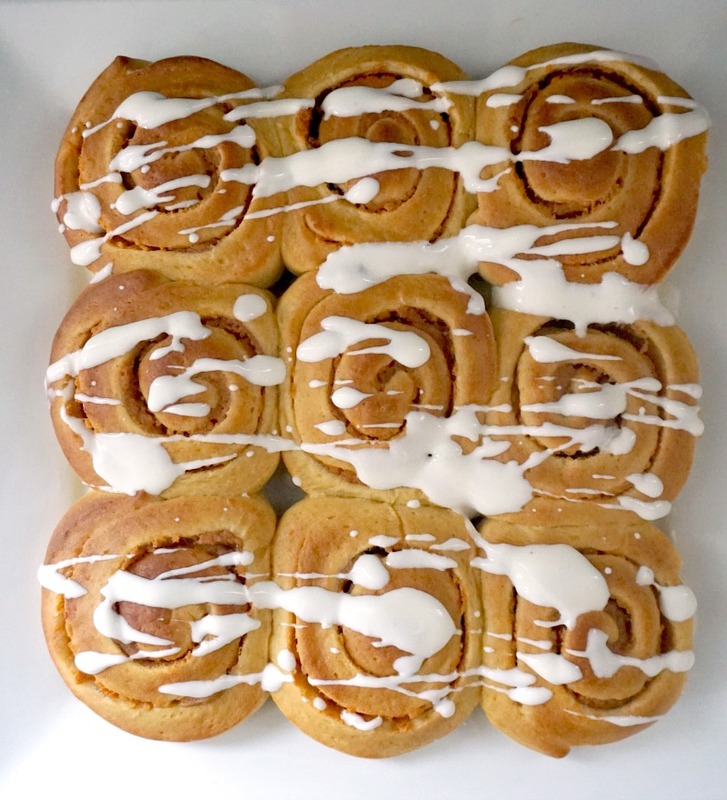 If you’ve liked my FLUFFY PUMPKIN PIE CINNAMON ROLLS or any other recipe on the blog then don’t forget to rate the recipe and let me know how you got on in the comments below, I love hearing from you! You can also FOLLOW ME on FACEBOOK, and PINTEREST to see more delicious food and what I’m getting up to. Fluffy Pumpkin Pie Cinnamon Rolls, the perfect Fall dessert for all the pumpkin lovers out there. 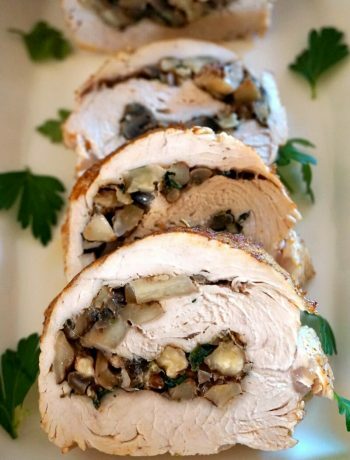 A great choice for the Thanksgiving menu or throughout the pumpkin season. 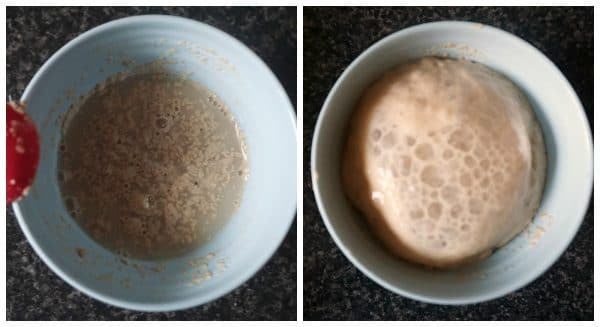 In a small bowl, add the water, yeast, half a teaspoon of sugar and half of teaspoon of flour, give it a stir, and let it sit for 10 minutes until the yeast forms a bubbly foam. In a large bowl, sift the flour, and add the butter. Use your fingertips to rub the butter until the flour ressembles breadcrumbs. Add the egg, sugar, cinnamon and pumpkin puree, and mix well. Once the yeast is foamy, add it to the bowl and knead everything together for at least 5 minutes until you get an elastic dough that does not stick to the bowl. Cover with clingfilm and a clean tea towel, and let it sit for at least one hour or until it doubles its size. To make the filling, mix the pumpkin puree with the sugar and cinnamon. Use a rolling pin to roll out the dough into a rectangle, spread the pumpkin all over, then roll the dough into a big sausage. Line a baking tray with non-stick paper, cut 12 pinwheels out of the big roll, and arrange on the tray, leaving a bit of space between each roll. Cover with clingfilm, and let it sit again for 30 minutes to one hour, until the rolls rise and fill the space between them. Preheat the oven to 170 degrees Celsius (340 Fahrenheit). Bake the rolls for about 20-25 minutes or until golden and fluffy. Leave to cool for 5 minutes. To make the glaze, mix the yogurt with the milk, and drizzle all over the rolls. Serve warm or cold.